Love will save the day if you can dream! And dreaming is not difficult in the amazing and dazzling Disney Princess line of inflatables. Snow White, Cinderella, Sleeping Beauty, Jasmine and Belle come together in a castle fit for a princess. Disney magic is always the perfect ingredient in any little princess's affair! 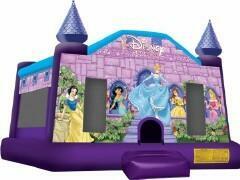 Rent the Disney Princess jump for your next event and bring the fairy tale to life right before your eyes!